D’Arenberg – traditional trailblazers ticking all the boxes! On a cold Wednesday evening in June I went with some friends to a tasting of d’Arenberg wines at Fassina in Somerton Park, Adelaide. 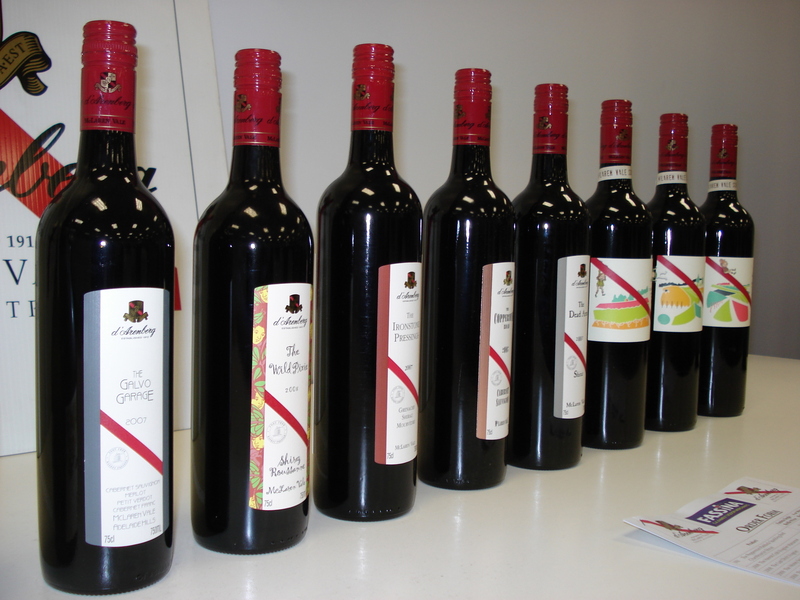 Anyone who lives in Australia and drinks wine knows of d’Arenberg and would instantly recognise the red sash across the label and nod knowingly at the consistent quality of their wines. Handed a glass of the Peppermint Paddock as we arrived, a bright purple sparkling chambourcin shiraz with great berry and jube flavours, layers of licorice and spice and a touch of earthiness, with balanced tannins and mineral acidity – this was a great introduction! Sometimes you need to revisit your established tastes and beliefs – to reaffirm or to adjust what you thought you knew. I have enjoyed d’Arenberg’s wines for many years and have always had a great experience at the cellar door – a must if you visit McLaren Vale. 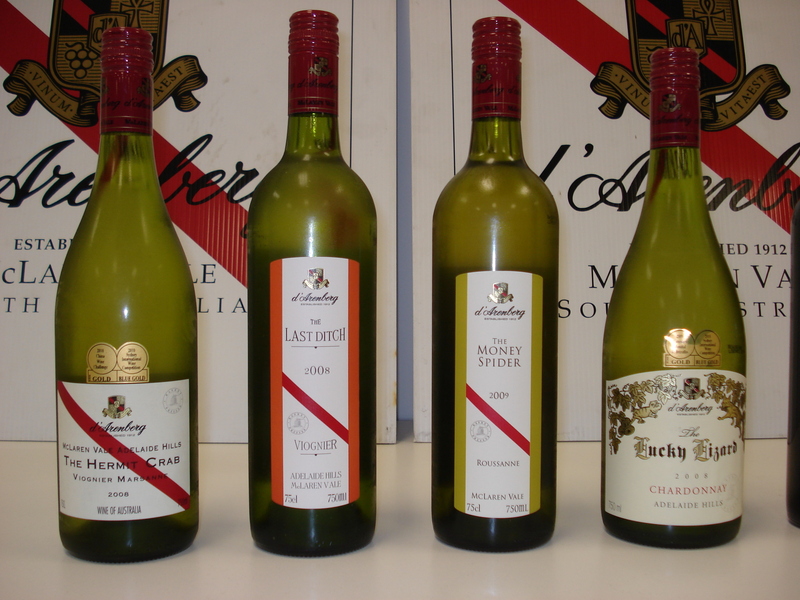 D’Arenberg is known mainly for red wines but also for fantastic whites – and not only for tradition but also for its originality, standing out as a trailblazer in South Australia. D’Arry Osborn, the wonderful, friendly and warm character and father of the current chief winemaker Chester Osborn, treated us to an array of fun-filled snippets and interesting facts about the winery and its history. He made me laugh out loud when he poked fatherly fun at his son for his renowned wild red hair – “I got my hair cut dad”, he was told, to which he replied, “which one?”. Chester is the fourth generation of this family owned business, established in 1912 – centenary deliciously close! McLaren Vale is not known for whites but d’Arenberg bucks this trend, with the Rhône varieties of viognier, marsanne and roussanne, and a superb chardonnay. All of these wines have a fresh, vibrant nose, followed through with a long viscous and complex palate, with varietal fruit, and a dry, mineral finish, leaving you smacking your lips for more. I have always particularly loved The Hermit Crab, deliciously different to anything else you will see in South Australia, with peach, apricot and zingy ginger and even pistachio, a luscious mouth feel and minerality on the finish. The Lucky Lizard Chardonnay was a fabulous surprise, one of the two wines that d’Arenberg makes from Adelaide Hills grapes (the other being their Feral Fox pinot noir). Pale straw in colour, it was elegant and complex and fresh, crisp and creamy, reflecting the expert winemaking with minimal oak influence, six months on lees and a portion of wild ferment. The reds were all made to be bone dry and elegantly oaked so that the fruit is not dominated by oak flavours. Jack tells us that the aim is for complex, elegant, powerful and well-structured wines. Again, music to my ears as I watch in horror some global trends (mentioning none in particular!) towards making sweeter wines and applying almost a factory mentality to winemaking. The nine reds we tasted all lived up to Jack’s description and covered a range of blends as well as the straight shiraz (including single vineyard masterpieces) and cabernet sauvignon. The first two blends were pleasing in very different ways. The 2006 Sticks & Stones with its predominance of tempranillo had a deep, complex and fragrant nose, and on the palate gave red fruits, black cherries, tomato leaf and herbs, with a gamey and earthy edge. As with the reds to follow, the tannins were fine and balanced with minerality, giving an elegant and long finish. The 2007 Galvo Garage, the classic cabernet sauvignon-dominated Bordeaux blend, treated me to vibrant varietal characters of blackcurrant with a touch of tomato leaf, the merlot adding fleshiness and a touch of forest floor, the petit verdot adding structure and tannin, and the cabernet franc generously giving fragrance, freshness, violets and elegance. This wine is always a real treat. Revisited and reaffirmed! The 2008 Wild Pixie is an unusual blend of shiraz and roussanne (there is also the more conventional shiraz viognier in the range) giving an intensely dark earthy wine with plum and chocolate and a touch of sweet fruit, backed up by gritty tannins and a long, dry finish. A perfect match for dark chocolate! The 2007 Coppermine Road Cabernet Sauvignon never disappoints but nevertheless its star quality still surprised me again as I breathed in the earthy, blackcurrant, chocolate and slightly eucalypt bouquet, with a touch of violets. The palate followed through with a varietal and savoury complex treat rounded out with the perfect tannin structure. The next four wines were 100% shiraz. The Dead Arm Shiraz is an icon of its own merit, enjoyed around the world. A lavender floral edge to the nose with spicy plum and blackberry give way to a powerful, rich, savoury, layered palate with blackberry and cherry and an earthiness rounded out by the balanced tannins. The wine gives the impression of power yet elegance. Next was my first ever tasting of the three single vineyard shirazes that make up d’Arenberg’s contribution to the McLaren Vale Scarce Earth initiative, launched on 1 May 2011 to showcase single vineyard 2009 shirazes from the region. Seventeen wineries are taking part: Brash Higgins, Chapel Hill, Coriole, d’Arenberg, Five Geese, Fox Creek, Halifax, Hugh Hamilton, Kangarilla Road, Maxwell, Paxton, Penny’s Hill, Primo Estate, Sabella, Serafino, Shingleback and Vinrock. While only a few hundred metres apart, d’Arenberg’s three single vineyard shirazes all exhibited distinct characteristics. The similarities were in the rich, dry, savoury palate, with a great mouth feel and grippy tannins. On the nose each one differed. The Little Venice had an earthy intensity with gamey aromas and some red fruits, and a touch of pepper at the end. The Fruit Bat was more open and plush with a hint of chocolate on the nose and a more plummy character than the Little Venice. The Eight Iron was beautifully balanced with an earthy licorice and mocha nose, with a hint of violets, and on the palate giving powerful and luscious plum – a brooding and intensely flavoured wine with those fabulous tannins taking your hand and walking you through a long and savoury finish. All from the 2009 vintage, these wines will certainly benefit from some careful cellaring. All with a RRP of over $100 and no shortage of customers, we were very lucky to taste these gems. Rounding out the night with the BFF! The sticky ending the night was the strikingly named 2010 Noble Botryotinia Fuckeliana Semillon Sauvignon Blanc. The name comes from the man Gottleib Fuckel who discovered this particular mould variety. While I don’t generally have a sweet tooth, a noble sticky has never let me down. Dark golden and gloopy, this wine is intense on the nose with honey, lemon, butter and a touch of crisp green apple. On the palate is all the complexity you expect with noble sweet wines – floral, honeysuckle, limoncello, paw paw and a little bit funky. Luscious, smooth, soft and a great end to a memorable evening. D’Arenberg’s wines are enjoyed in over 60 countries, on cruise ships such as the QE2 and on major airlines including Singapore Airlines and Emirates. The more you learn about this winery and taste its wines, the luckier you feel to be living right next to it and to have access to the colourful people and to the varied and premium quality wines. This entry was posted in Cabernet sauvignon, McLaren Vale wine, New World wine, South Australian wine, Syrah/Shiraz, Wine events and tagged Australian wine, Coppermine Road, d'Arenberg, Dead Arm Shiraz, Galvo Garage, Hermit Crab, McLaren Vale, Peppermint Paddock, Scarce Earth, shiraz, South Australian wine, Sticks and Stones, Wine, Wine2030. Bookmark the permalink. 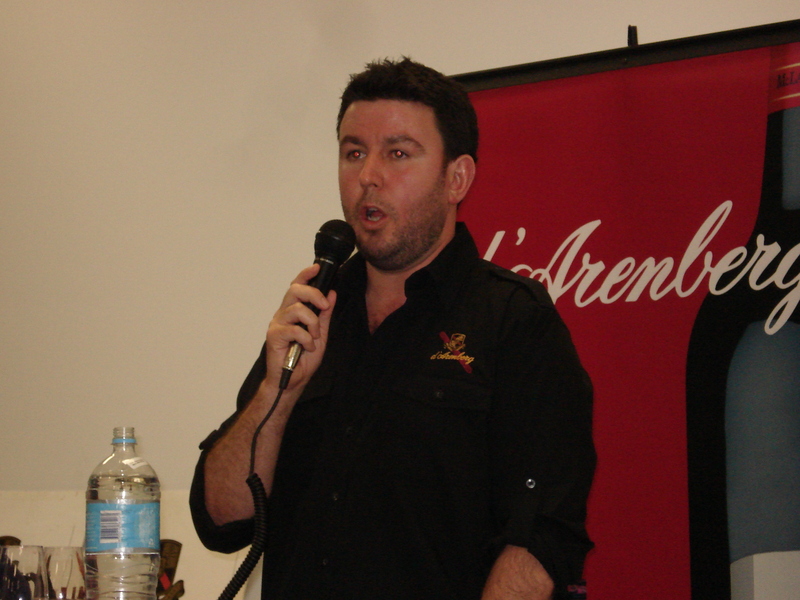 8 Responses to D’Arenberg – traditional trailblazers ticking all the boxes!